The threat to Prentice existed for over a decade. Northwestern Hospital and Northwestern University are located in the crowded Streeterville neighborhood of Chicago where high land values have put pressure on smaller buildings in favor of higher density. When a new Prentice Hospital was built nearby, the upper floors of Goldberg’s building were left empty and only the base was occupied. In 2011, when the base was also vacated, the building was transferred from the Hospital to the University who made it clear they planned to pursue demolition as soon as possible to clear the site for the eventual construction of a medical research facility. Because the building had no landmark protection and was built after the 1940 cutoff of the Chicago Historic Resources Survey, there was no local protection or applicable demolition delay. 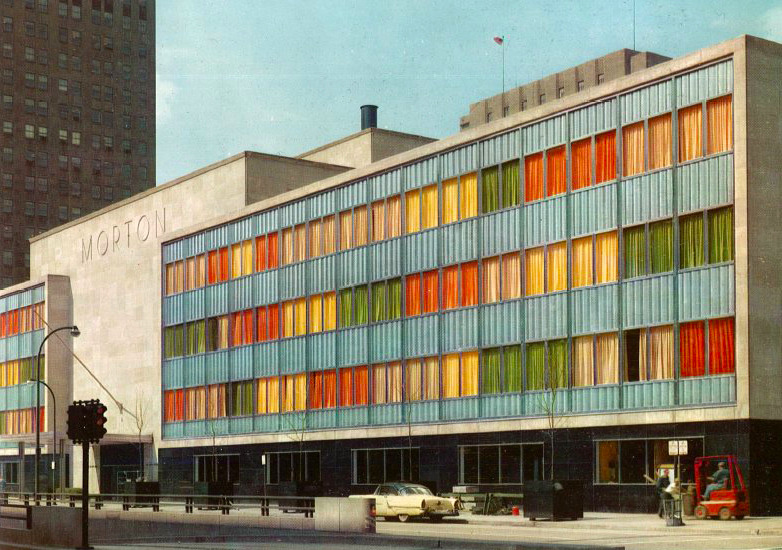 The Morton Salt Headquarters Building was designed by Graham, Anderson, Probst and White in 1958. Although better known for Art Deco landmarks such as the Merchandise Mart and the Civic Opera Building, the firm used boxy volumes and a rich material palette of stone, glass, and stainless steel to create a striking midcentury Modernist corporate headquarters on Wacker Drive. The Morton Salt building, most recently occupied by General Growth Properties, was found eligible for inclusion in the National Register of Historic Places by the Illinois State Historic Preservation Office. After a new 53-story office tower was proposed for the site, Docomomo Chicago participated in a Section 106 federal review process. The review process resulted in the decision to salvage the polished stainless steel panels for reuse on a portion of the new building as well as for informational displays in the new outdoor public plaza. An educational seminar on Chicago’s midcentury architecture will also be held later in 2018. Before demolition began in January 2018, the Morton Salt Headquarters Building was documented through measured drawings and photographs for the Historic Illinois Building Survey. This documentation will be archived at the Art Institute of Chicago and at the Abraham Lincoln Presidential Library in Springfield.